Planning & Designing Inclusive Communities. An inspiring and practical one-day conference exploring the planning and design of inclusive and sustainable communities through the Cohousing movement. Cohousing is seen as the new development model that can deliver both resilient and affordable, and happy communities at the same time. New models, new thinking and new incentives are needed to create affordable, inclusive and resilient places that embed a sense of place, community ownership and pride, mental health and wellbeing and low impact living. Participants will hear from leaders in the field who have on the ground experience. American Architect Charles Durrett arriving to Australia next month. More details on his visit, scheduled talks and workshops in Sydney, Melbourne and Hobart will come soon. 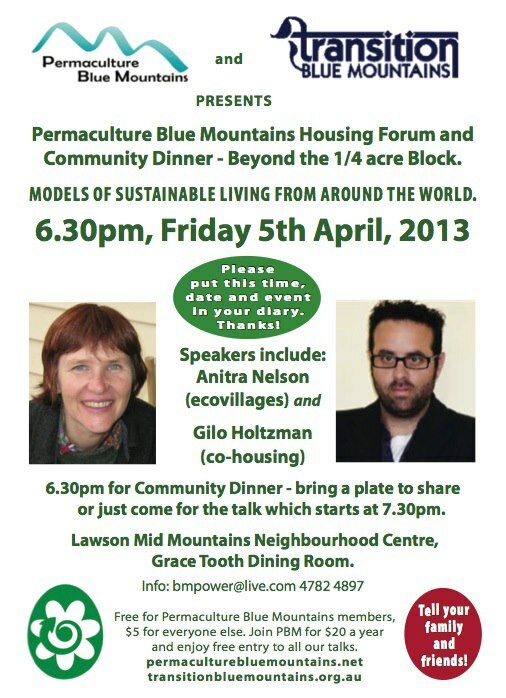 Don’t miss out on this great opportunity to see a cohousing community in action! 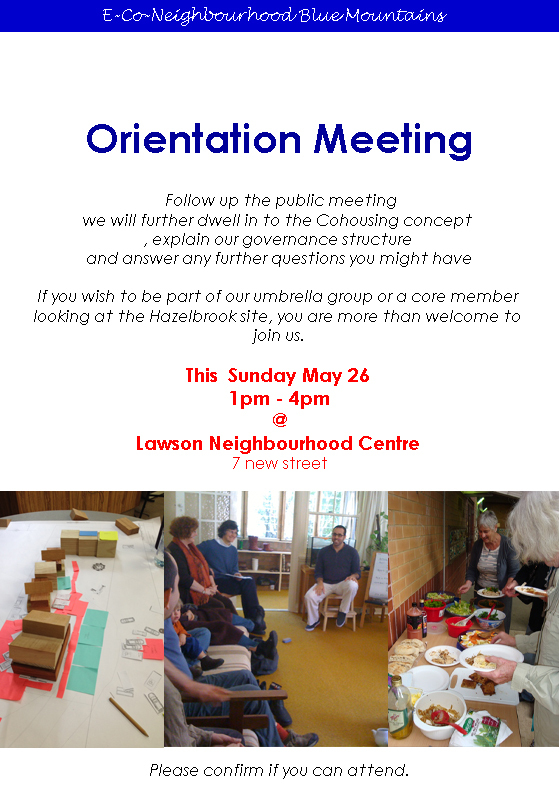 Come along for a day of talks, discussions and a tour of Murundaka Cohousing Community. 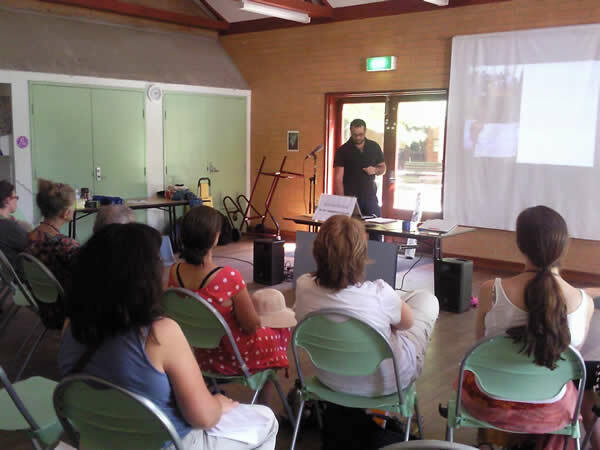 Meet residents and find out what it's like living in an intentional community in the suburbs of Melbourne. 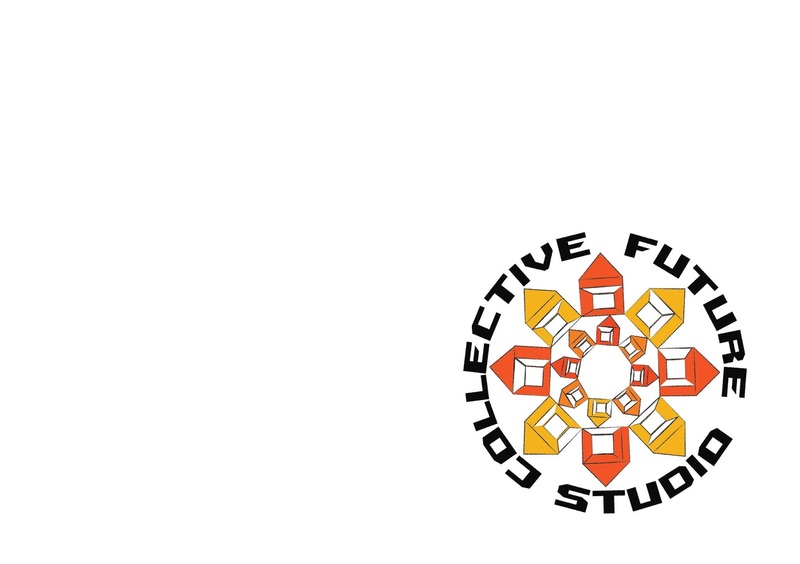 Collective Future Studio’s primary work is on collaborative housing and neighbourhoods models that are environmentally and socially aware. 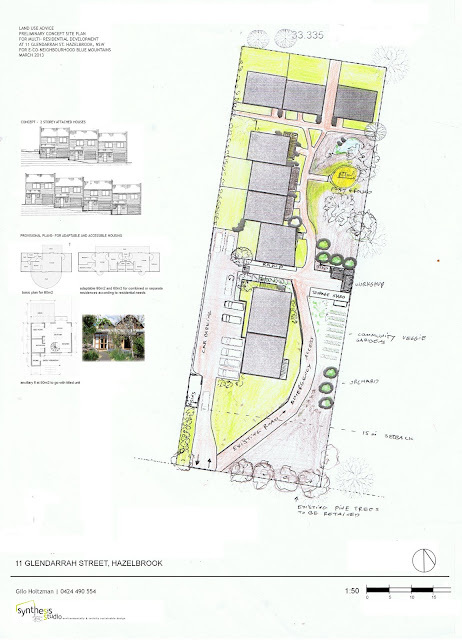 Our overall aim is to demonstrate a range of planning and architectural solutions for progressive residential models (such as Cohousing and Ecovillages,shared living...) both in rural and urban settings. Headed by Gilo Holtzman, the studio offers a wide range of services consult and design, from community building, governance and conflict resolution to planning and design. Thus for every project we put together the most suitable team of passionate professionals, or work together with your consultants, to meet your community needs. That is why in order to achieve best outcomes we encourage through our workshops, full participation in the process. 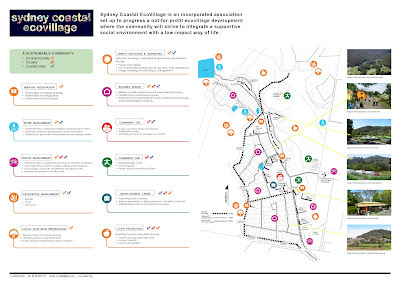 The encouragement of a participatory process means that each participant / stakeholder becomes an important contributor to the planning and design process, and has some role in decision-making and is extremely important in achieving the best design of our immediate environment of homes and neighbourhoods. 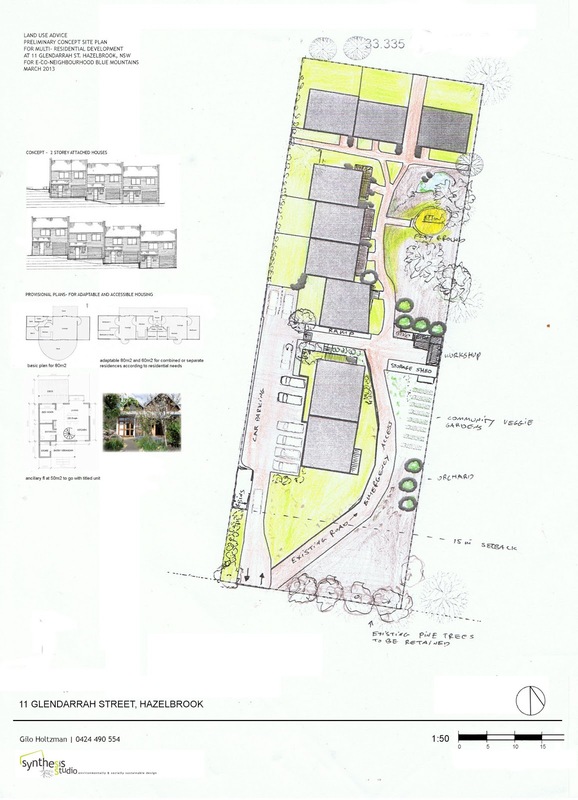 the mid-mountains cohousing group are slowly advancing, with plans to start developing their site early next year. in the meantime, common meals every wednesdays night which are open to any interested party. before advancing into the second stage of the village development. 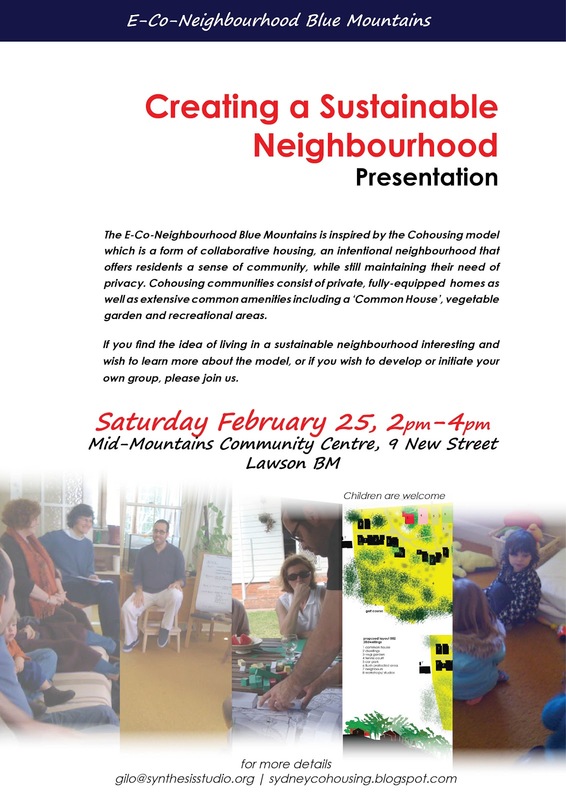 Come and see us at E-Co-Neighbourhood Blue Mountains stall, where you can chat and discuss with us about our project, or anything about community oriented housing. 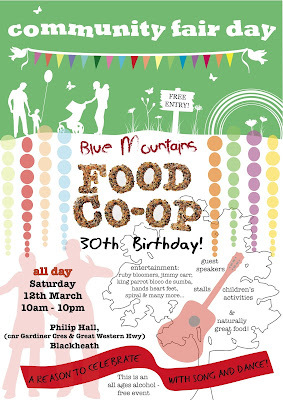 you can also enjoy this family day including market and food stalls, live music and children's activities. Coming up ' Design Vision & Eco Programming Workshop"
Location: 11 Glendarrah Street Hazelbrook, NSW 2779 minutes walk to shops, train station. A Community Living, eco- cluster development with options for an inter-generational population and to provide flexible housing for a population trending towards smaller household size and to ensure these dwellings are flexible for future needs. Enabling local communities to create resident –led sustainable developments to meet local needs. Residents will have extended access to communal land and Common House. Verandas to face the common areas as transition between the private to the public areas. Shared facilities encourage social interaction and collaboration. A sense of belonging is created through the sharing of responsibilities and skills. Plants selected for common areas to minimise watering requirements. Exploration of open loop grey water system. Achieving affordability is one of our aims, however for this small development with only 12 units for sale, building and buying is not cheap. It is assumed that cohousing developments are the answer for affordable housing. The reality is that cohousing development will cost usually more than similar housing type developments (townhouses, duplexes etc’.) the extra costs are usually due to the extensive common facilities ( Common House, Workshop...) and high quality and standards of the construction which includes emphasis on green design. Therefore what we are seeking is long term affordability by creating the platform that will allow us to live more affordably. Even though we hope that we can still create some opportunities for affordable rentals, achieved through agreements with pioneers or housing associations to enable more diversity. This is an opportunity to join the E-Co-Neighbourhood BM and be involved in the design of this great community. Obtaining Council development approval- this stage will involve the professional team of architects, and consultants. Any delays in approvals or changes to the design will result in additional fees. Construction risk, involves delays, change orders, rising costs, whether. The proposed average prices for purchase “off the plan” (pioneers/ investors) are slightly lower than the current market prices in the area. The costs of homes are not definite and may vary depending on the final size number of dwellings, diversity of dwellings and contractor bid. Cash investments- to finance site purchase and pre-development project costs. Expect return on investment commiserate with risk taken .Other investment discount on the dwellings purchase price will be available for ‘early bird’ community members. There are 4 ways to invest with us to make it real. was published today in Ecos Magazine. ECOS, CSIRO publication is Australia's most authoritative magazine on the science of sustainability and the environment. from small outlays, as shown by examples in our appendix. on Page 47 of the report cohousing is presented as one contemporary example of innovation in residential arrangements . 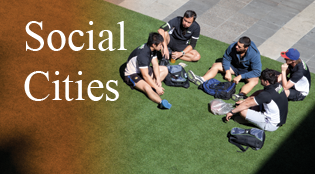 Kelly, J-F.; Breadon, P.; Davis, C.; Hunter, A.; Mares, P.; Mullerworth, D.; Weidmann, B., 2012, Social Cities, Grattan Institute, Melbourne. At the orientation you will meet some of the group members, learn in more details what our aims are, how we run our meeting and you'll also get the chance to ask us anything. Pls confirm if you intend to come, just so we'll know what to expect. After many years of hard work by Lyndall Parris and a group of volunteers , the moment of truth is near, where the preferred land for Sydney Coastal Ecovillage development in Nararra is up for sale. have a look at the link below, can you imagine anything else but an Ecovillage with some Cohousing clusters in it? Gilo delivered a comprehensive preso on co-housing and it's variants, using plenty of examples from all over the world and Australia. Next Presentation some time in the next few week will be in Sydney, details soon. Gilo will introduce the Cohousing Model concept and the E-Co-Neighbourhood Blue Mountains group intent and progress. Modern cities are facing increasing challenges around social isolation, population growth, housing shortages and resource distribution impacted by climate change. Managing growth, reducing traffic, creating sustainable development, sharing resources and amenities are all challenges we face today. Within these challenges, the importance of an individual to make a change comes from one‘s need to gain back the control over their way of living. Where we live and what we eat are influenced by what we can afford and by what is sold to us and these choices are usually being dictated to us by big Corporations (70% of the work force work) . About 2,400 years ago, the Greek philosopher Plato described an ideal community where everything was organised collectively. In 1506, the Englishman Thomas More published the book “Utopia, which gave a name to such visions. In Mores‘ideal community, people were to live in neighbourhood groups with common dining rooms and various shared leisure facilities. Slow neighbourhood draws its inspiration from the notion of the old neighbourhoods, where neighbours knew and supported each other, and such utopian ideas of collaborative living and sharing , while preserving our contemporary way of living which values the private as well . 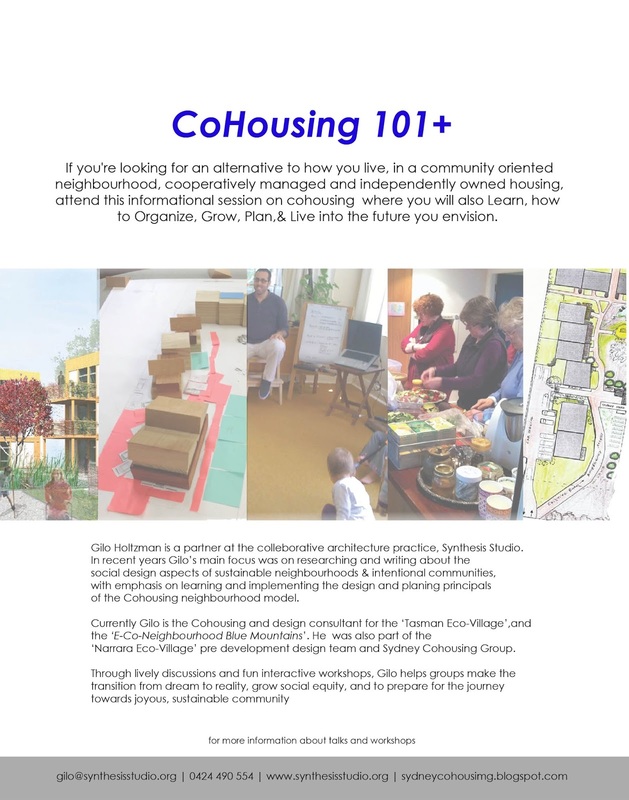 Cohousing communities are neighbourhoods which feature common facilities, sustainable living practices and good connections with neighbourresidents, with residents actively participating in the design, planning and operation of their own neighbourhoods. That is, cohousing is a form of intentional community. The cohousing model involves participation by residents within a non-hierarchical management structure, fostering shared decision-making, creating and maintaining a caring community, fostering the development of meaningful relationships between neighbours, and ensuring that residents feel a sense of belonging. As a result, cohousing communities tend to encourage a sense of physical safety. The physical layouts of the neighbourhood buildings encourage this: the design is pedestrian-oriented, aiming to encourage opportunities for casual meetings between neighbours; there are large common houses/facilities which provide space for both planned and spontaneous get-together such as celebrations, hobby clubs, movie-watching and shared meals. 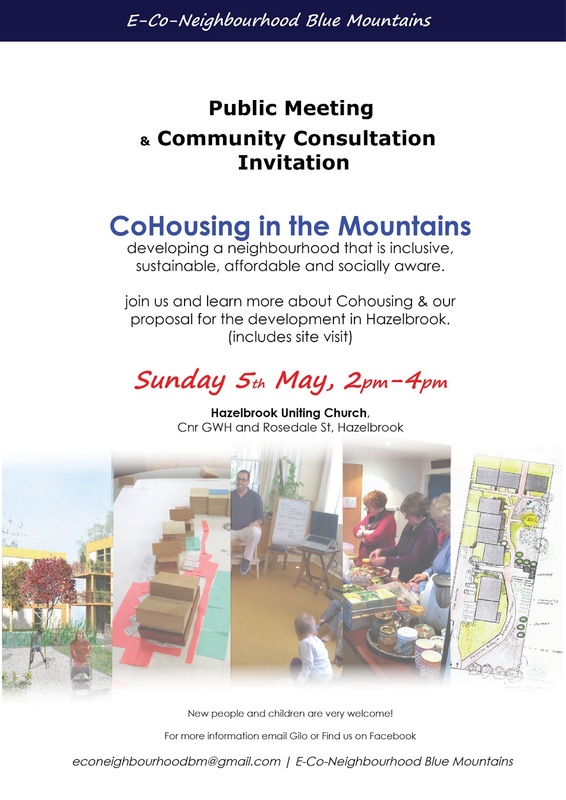 While many people are now searching for new ways to take back control over their lives, Cohousing (and ‘Pocket Neighbourhood ‘concept that I will write about in another post) provides innovative solutions to many of today’s environmental and social challenges. 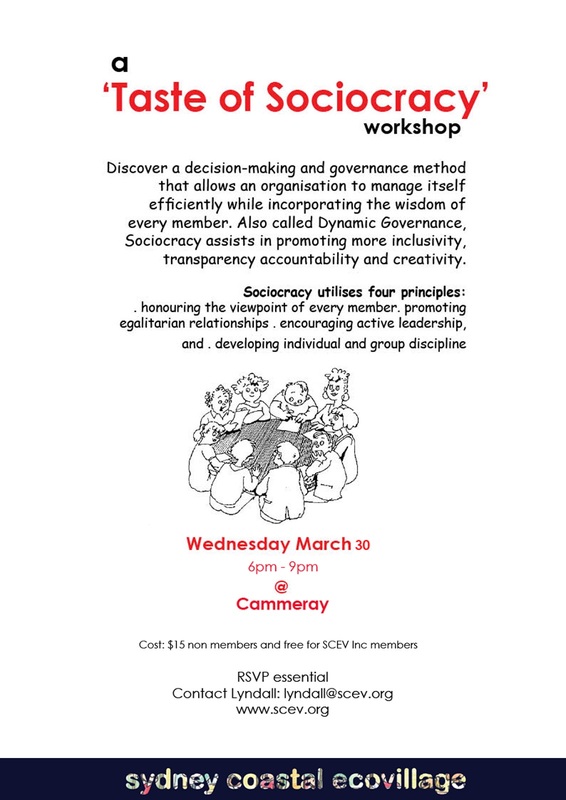 on behalf of the Blue Mountains cohousing group I would like to thank all the people who joined us to this very insightful Sociocracy workshop. Thanks to Jasmine for organising this and to Gina for sharing her knowledge with us. we had a great weekend where we learnt and practice how to run meetings in an efficient way. Gina was wonderful and very helpful in getting us through this. the advantages of this governance tool over other existing tools which aimed at achieving consensus, lies in its efficiency , its measured hierarchy which from my point of view empowers the participants to be part of decisions making and take responsibility for her actions. Dear Friends - you might like to attend this! please forward if you think appropriate. We feel that this has great potential for community and non profit organisations. Sociocracy is a decision-making and governance method, based on recent discoveries in systems theory, that allows an organisation to manage itself efficiently, while incorporating the wisdom of every member. 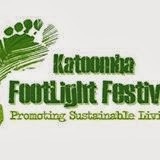 an organisation to flourish in a changing environment. Ultimately it can throw light on today’s big issues, whether it be climate change, water management or the energy crisis. Gina is based in Western Australia and we are fortunate to have the opportunity (at lower than usual costs) on the dates below. Places are limited and bookings are essential! Location: Mid Mountains Community Centre, New Street, Lawson. Lawson is 90km from Sydney, with accommodation is available at “The Blue Mountains Hotel”. Venue has wheelchair access and car parking, and is a 5-minute walk from Lawson railway station. Childcare: Mobile Minders childcare is available on-site – bookings essential by Tuesday 25 October. Friday 28 October: Evening Workshop and BBQ 6pm start $25/head Please advise if you are vegetarian. 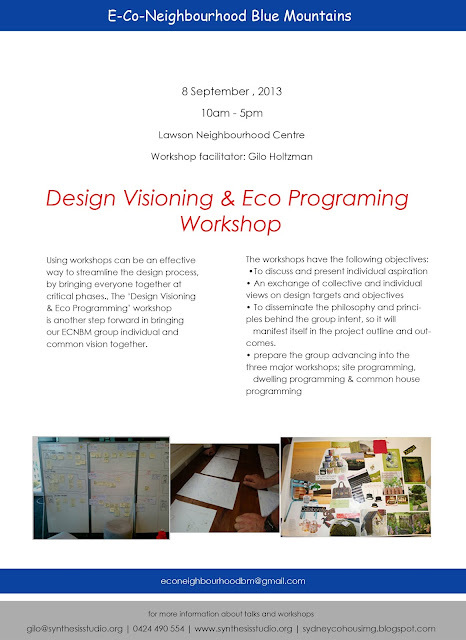 Saturday 29 October: Book for both workshops and save! In our pursuit for a common vision for our future cohousing neighbourhood we talk and discuss theoretically what we want our life to look like in such community, we think about our homes our wider neighbourhood and how we envision them to be. but since its mostly theoretical it's hard for many of us to comprehend the physical scale of both our homes and community. This vision realisation exercisethat I did to the Blue Mountains Cohousing group is the first of many, which its main purpose is to ground the group in thinking first about their individual homes by sketching it, and we do the same for the community,we then analyse the sketches. This process helps raise questions about our wants and needs, how these correlates with our vision. it opens our eyes to the various possibilities and better understanding of what cohousing is. this exercise will also prepare the group for future design workshop if we hopefully reach to the stage where we have a land to build on. 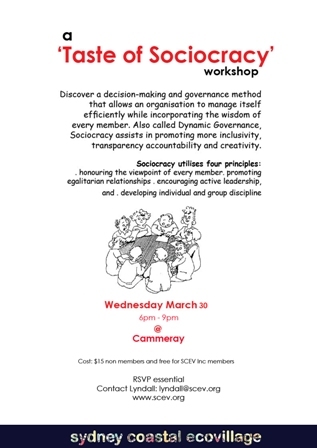 A full house of diverse and interesting people joined us in Katoomba neighbourhood centre for our ‘Taste of Sociocracy’ Presentation also known as Dynamic Governance. Lovely Lyndall gave us an insight of Dynamic Governance, what it means and how it works, and it sure did left us a taste for more. 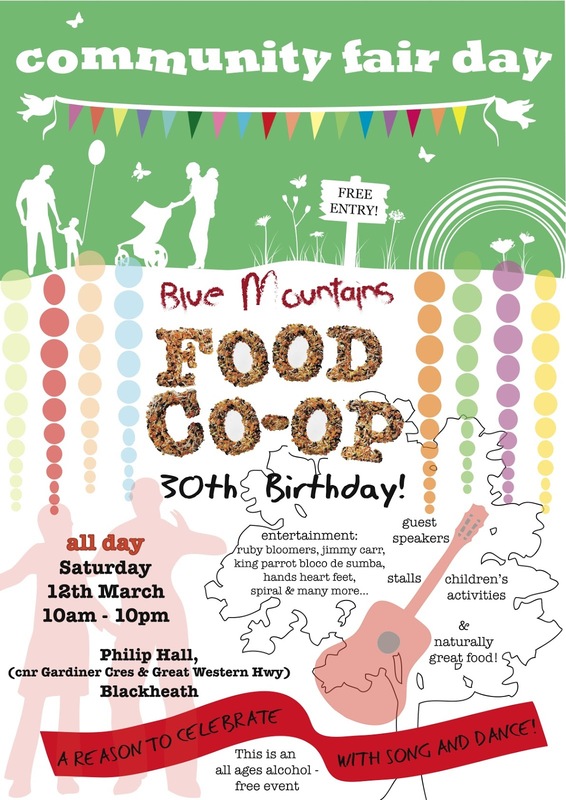 the Blue Mountains Cohousing will have a stall @ the BM Food Co-Op Fair In Blackheath.